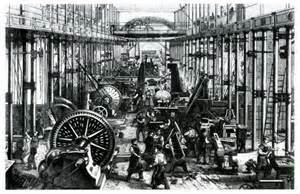 Industrial Age - The Industrial Age was ushered in by England around 1760 with the introduction of the steam engine. It was a machine which utilized coal to produce steam to perform mechanical work. Humans had already known about the potential of steam for centuries, but the steam engine allowed it to be produced in such quantities that work never before imagined could now be accomplished. The steam engine would be followed by the harnessing of electricity and the internal combustion engine. Its downside was the creation of pollution. But its upside was the rise in standard of living and quality of life for the human race as a whole.